Since the early days of the .epub and .mobi formats, writers and publishers have been trying to find better ways to make ebooks. Some writing apps included primitive built-in options. A few design apps offered limited-functionality exports. But few apps have thoroughly focused on building ebooks. 180g’s Vellum is one of the few pieces of software dedicated to doing just that. It’s not a word processor, nor is it a design program. 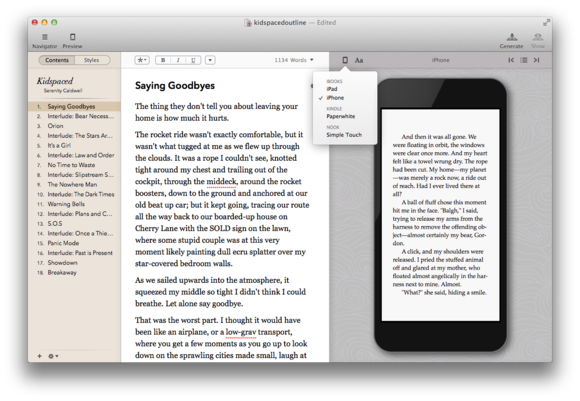 Rather, it’s an app for turning your finished manuscript into a beautiful ebook. Rather than launch with half-built bells and whistles, Vellum 1.0 provides the basic necessities you might look for when building an ebook. 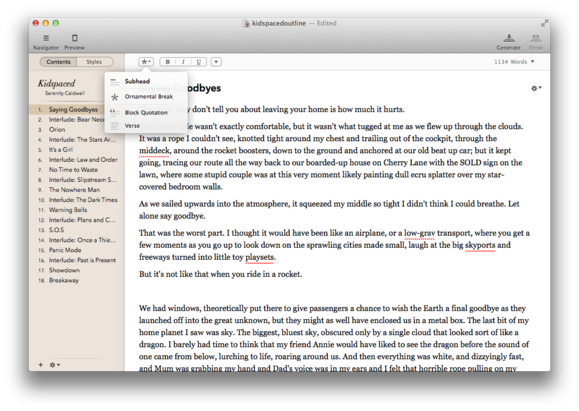 You can import your manuscript from a Word doc; style text, subheads, breaks, block quotes, and verse; preview a live version of your book for the iPhone, iPad, Kindle, or Nook; and export multiple versions with a single click. Vellum’s controls are both expertly designed and easy to learn, capturing the feel of one of Apple’s iLife apps: There are a bunch of options, hidden away, if you need to apply them to your manuscript, but you can ignore most of those extras in favor of quickly building your book. On the other hand, like the iLife suite, Vellum isn’t designed for customization junkies. The ebook enthusiast who wants to customize everything from link colors to page borders will be sorely disappointed. That’s not to say there aren’t options for tweaking your book—the app provides an array of beautifully rendered customization options for your book style, headings, the first paragraph of a chapter, block quotes, ornamental breaks, and the paragraph after a break—but you’re currently limited to the styles Vellum offers. One reason for this is the app’s excellent cross-platform preview and export engine. Vellum is one of the few ebook exporters that lets you create ebooks for iOS devices, the Kindle, and the Nook with one click—no changes necessary. The app even offers live preview options for every major ereading device, which is a huge improvement over the “export and guess what it will look like” game most of us in the ebook-publishing industry play nowadays. To both render previews and export proper files, Vellum needs HTML/CSS-compliant code for each platform, and the easiest way to ensure this is to eliminate user input (at least for version 1.0). This is also likely why you can’t currently embed images or video. Both features are reportedly on Vellum’s eventual roadmap, but for now, the program remains medialess. What it lacks in image or video embedding and custom stylesheets, however, it more than makes up for in ease of use and style. If I planned on self-publishing a novel and had no major HTML or CSS experience, I would absolutely use Vellum to prepare my manuscript. The app handles the technical mumbo-jumbo of ebook building, letting me focus on writing. Whether Vellum’s export price is worth it depends on how much you value ease of use and the look of your work. It’s possible, with many hours’ worth of work by you or a contractor, to style an ebook similarly by hand-coding HTML or CSS, but re-exporting revised text into that styling can prove difficult. Likewise, you can export an ebook from manuscript software such as Scrivener, but the interface is clunky, it requires a separate export for each ebook format, and you’ll often find problems or embedded errors. 180g hopes to compel writers and novice ebook producers to uses Vellum by removing those complications and making the process as simple as clicking a few buttons. On behalf of ebook readers everywhere, I hope the company succeeds. 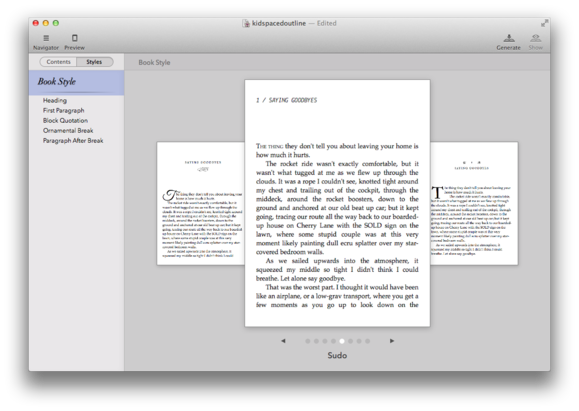 Promising ebook-production app offers easy templates, excellent preview support, and beautiful multi-version export.